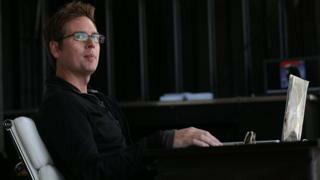 Twitter co-founder Biz Stone has said he plans to rejoin the social media site in the next few weeks. His return comes after an invitation of fellow co-founder Jack Dorsey, who was brought back as chief executive in 2015. Mr Dorsey has been trying to reboot Twitter, which claims more than 300 million monthly users, but has struggled to turn a profit. Twitter's stock bounced nearly 2% on the news. Mr Stone said he will focus on the culture of the company. "I'll shape the experience internally so it's also felt outside the company," he wrote. "More soon." Mr Stone left Twitter in 2011, after the exit of fellow co-founders. He went on to start the publishing platform Medium and a search app, Jelly Industries, which Pinterest acquired this year. After a recent visit to Twitter, Mr Stone said he couldn't turn down the chance to work there again. "When I stood next to Jack addressing the crowd of employees, I felt the energy, and I was overcome with emotion," he wrote in a post on Medium. "I realised in that moment that Twitter was the most important work of my life." Mr Dorsey also shared the news on Twitter, writing: "Excited to have Biz's energy and heart back at Twitter! #BizIsBack"